Position: North side of campus. One side is across the street from Fry Apartments and the other from Miller Residence Hall. Bio: Four-year Naugle Resident Director, Josiah Hatfield, says Naugle’s lawn space makes it unique. Trees, a sloping hill, and plenty of sunshine in the fall and spring, make Naugle a “majestic” view from the road, says Hatfield. 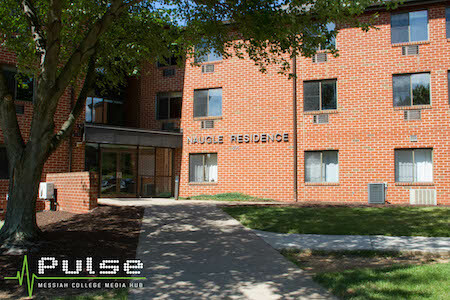 Besides the lawn, first-year students can appreciate a dedicated RA staff in which many are familiar with Naugle. Hatfield says he hires back many Naugle alumni and RA’s from previous years to build upon the previous year’s work. Naugle also boasts a fun twist on the first-year community weeks with “Nauglympics.” Nauglympics is a weeklong spring event with different competitions every day. Notable: While the other two first-year resident directors have babies, Josiah and his wife Jorjette, are the proud parents of cat Eleanor. Eleanor can often be seen basking in the window of the Hatfield’s Naugle apartment. Position: South side of campus. 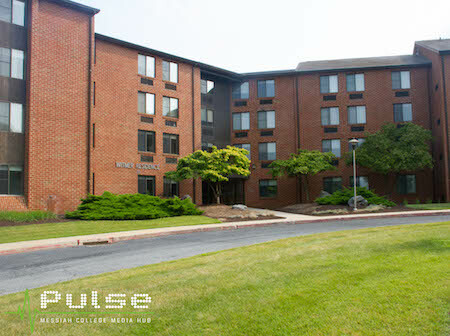 Located in the south complex with Mountain View and Sollenberger Residence Halls. Across the street from Witmer. Bio: Two-year Bittner Resident Director, Tim Ferret, says that although Bittner is smaller in numbers, the floors themselves are larger than those in Witmer and Naugle. Each floor has a strong identity and tradition that helps build community. Students living in Bittner this year will become a part of the long-standing Bruderhof, Ohana, Basilea, or Laule’a traditions depending on which floor they are assigned to. Students can look forward to events such as the building’s picnic, named Bitnic in the fall, Bittnerween on Halloween, and worship opportunities or gym nights during J-Term. During the spring, Bittner hosts “Beach Week”, named after the popular lawn spot outside the building, Bittner Beach. Notable: Due to an increased demand for upper-class housing, there will be a fair number of upper-class students living in Bittner. Ferret says the number of upper-class residents living in Bittner this year is higher than the past three years. While some may view this as a challenge, Ferret is excited to make upper-class students a part of the Bittner experience. Position: South side of campus. Next to Mellinger Apartments and across the street from Bittner. Bio: While Witmer is often known for its seclusion, three-year Witmer Resident Director Paula Hoffman says that’s one of the best parts of the building. The seclusion gives students a chance to “rally together,” says Hoffman. There are other positive aspects to Witmer’s location, such as the close proximity to the Witmer cross, the fit trail, and the soccer field. One thing Hoffman likes to do is host different finals week activities each night. Last year she set aside coloring books and crayons for residents. Another night was devoted to peppermint with peppermint patties, mints, gum, and tea, because peppermint is good for memory. However the most well-known Witmer tradition is winning the coveted golden torch during the first-year games. If Witmer can manage another victory this year, the building will pull off a never before seen three-peat. Notable: Hoffman and her husband, Rusty, are excited to introduce their five-month old son Finlay to the new students.